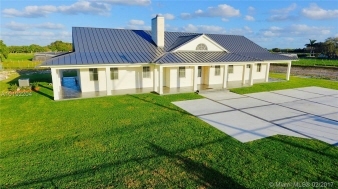 Luxurious 5/4 modern home on 1 acre. The great room invites you in with a gorgeous fireplace & a beautiful Pecky Cypress ceiling. The Mobica kitchen has SS Appliances, wine rack & beer tap, island range & French doors. The master suite amenities include a Cypress ceiling, recessed lighting, private bath w/DXV tub, rainfall shower & dual sinks. All baths are tiled floor to ceiling. All bedrooms have electronic blackout blinds. The home has 12ft Shaker doors throughout, as well as impact doors & windows.